Launching 9/12/18 - Concussion Champion Program! Pacific District Hockey is very excited to announce the new inititive, Concussion Champion Program. Click on the link below to learn more about the program. Pacific District SafeSport page has been updated with 2018-19 changes and legislation. Concussion Protocol Webinar available here! Concussion Protocol Webinar is now available online. Introducing USA Hockey's new Goalie Coach Development Program which works in conjunction with its Coaching Education Program (CEP) to give coaches at every level the opportunity to hone their goalie-teaching skills. Girls 15/16/17 Player Development Camp and U18 Select Camp List. The Pacific District is proud to announce this year's nominations for the 2018 @USAHPDC in Amherst, New York. Congratulations to the players that have been nominated to represent the Pacific. USA Hockey introduces new concussion acknowledgement with national registration period. USA Hockey has taken a major step forward with the inclusion of the required acknowledgement below, effective with every new annual registration. Jeff Jackson is the head coach of the highly ranked Notre Dame men’s hockey team and has coached at various other levels, including with USA Hockey’s National Team Development Program. No matter what level he has coached at, though, Jackson has found the old cliché to be true: The only place success comes before work is in the dictionary. When the clock is winding down and a youth hockey coach looks up from the bench at a one-goal game, there is a natural temptation … to win. And with that temptation comes the competitive-nature’s no-brainer to handpick the best players for the next few shifts and salt away the W.
Does your rink have an AED machine? USA Hockey has an agreement with One Beat, who will provide defibrillators at discounted pricing to USA Hockey members. They will also provide all the training, as well as service packages for the ongoing maintenance of the equipment. A new Concussions in the Media section has been added as an educational resource. Information will be updated on a regular basis as newsworthy articles in all sports are added (but especially hockey). Young boys and girls in California have plenty of choices when it comes to sports: soccer, baseball, softball, basketball, football, dance, martial arts… and that’s just scratching the surface. There was a time when hockey would have been at the bottom of such a list, if it made it at all. Not anymore. According to USA Hockey affiliate membership reports for 2016-17, California saw the largest increase of 8U players in its history, up 25.2 percent to 3,553. Participation among girls was particularly impressive, jumping 49 percent, a new record high. USA Hockey’s data has consistently shown that growth among players ages 4 to 8 has a positive impact on retention in the larger 9 to 14 age group. O, say can you see... a U.S.-dominated NHL? 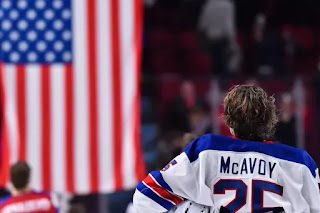 So here’s an uncomfortable question: Will hockey still be considered Canada’s game in 2028 when there are more Americans than Canadians playing in the NHL? I’ll wait here while you mop up that coffee. While the idea of an NHL dominated by the U.S. may sound preposterous to any Canadian told from birth that we’re the greatest hockey-playing nation on earth, you cannot argue with math. Or, for that matter, with what’s been going on in suddenly hockey-crazy U.S. cities such as Nashville, where the Winnipeg Jets were visitors Monday night. USA Hockey, the Central District and the Amateur Hockey Association of Illinois are proud to welcome and invite you to the 14th annual Toyota-USA Hockey Disabled Hockey Festival to be held at the Leaf's Ice Centre in West Dundee, Illinois. The need for diversity has been something that has plagued the NHL for much longer than their Hockey Is For Everyone initiative has been around. Latino communities in particular haven’t seen themselves reflected in the world of hockey until recently. The first Latino NHL player, Bill Guerin, who is of Nicaraguan descent, was drafted in 1989. Another Latino player wouldn’t be drafted until Scott Gomez in 1998. As it stands right now, there’s still only a handful of Latino players in the NHL; among them are Al Montoya, Max Pacioretty, and Alec Martinez. Keeping up with the Joneses may as well be an epidemic for the hockey community. What is he or she doing this summer to get ahead? What team is she playing on next year? Who are they working out with now? Finding a spot on an elite youth or high school team is one of the most worried-about aspects of a hockey player’s development and advancement. It doesn’t need to be, however. Sure, playing on a top team in your age group or making a showcase squad for a major tournament may help in the quest for more exposure and better skills. But it’s not the most important thing for a hockey player’s growth overall. The best hockey players will be found, no matter where they are playing. Opportunities will come to those who earn it. NHL Commissioner Gary Bettman stressed the importance of youth hockey during a summit with the commissioners of the other three major sports -- Rob Manfred of Major League Baseball, Roger Goodell of the National Football League and Adam Silver of the National Basketball Association. Bettman said Tuesday that the amount of young players registering to play hockey has allowed the sport to grow in traditional and non-traditional markets. With the NHL more visible and its games more accessible across North America, children have become more enthusiastic about playing hockey at an early age. The Oilers used their 22nd-overall pick in the 2017 NHL Draft to select Kailer Yamamoto from the Spokane Chiefs. Here are three things to know about the player and the pick. Pacific District celebrates and thanks Rae Briggle for her 26 years of tireless and dedicated service to the membership of USA Hockey. For the better part of three decades, countless Alaska hockey coaches, administrators, parents and assorted officials who needed a question answered accurately and promptly received the same response: Call Dan. Hockey Canada wants all of Canada on the same page when it comes to the delivery of its Initiation Program – traditionally a player’s first brush with organized hockey at the ages of five and six. Although the Initiation Program – originally developed more than 35 years ago – always recommended cross-ice or half-ice small-area games, its delivery has varied from community to community. Beginning in the upcoming 2017-18 season, a new Hockey Canada policy now mandates that Initiation-aged players receive age-appropriate programming on cross-ice or half-ice surfaces. Born in Modesto, California to crop-picking parents, Carlos Gomez never could imagine that he would one day have a son playing in the National Hockey League (NHL). Shortly after Carlos was born, his entire family was deported for not having proper paperwork, landing them two hours from Puerto Vallarta, Mexico. While living here, a family tragedy occurred which caused Carlo’s mother (Maria) to pack up her ten children, separate from her husband and move Tijuana with family. Maria was determined to escape poverty. Children should spend at least three hours a day performing physical activities, according to the Finnish government. Parents have been advised to actively encourage their children to pursue hobbies and interests that require physical exertion. Edward James Samuels, 30, passed away Saturday, Aug. 6, 2016. He was born May 5, 1986, in Vorhees Township, N.J., and was a 27-year resident of Las Vegas. He was a star hockey player in Las Vegas playing roller hockey for the Las Vegas Tour Rebels at Crystal Palace in Las Vegas, then ice hockey for the Las Vegas Mustangs, San Diego Jr Gulls, BCHL Victoria Salsa, NAHL Billings Bulls and was team captain for the NAHL Fairbanks Ice Dogs. He is survived by his parents, Mary Margaret Samuels and Lee Samuels of Las Vegas; brothers, Ross Brown of Leavenworth, Kan., and Rich Samuels Jr. of Las Vegas; sisters, Shelly Cruz and Mary-Cate Zurfluh of Las Vegas; and fiance, Lelani Ho of Utah. Visitation will be 4-7 p.m. Thursday, Aug. 11, at Palm Mortuary, 6701 N. Jones Blvd. Funeral Mass will be at 10 a.m. Friday, Aug. 12, at Our Lady of Las Vegas Catholic Church, 3050 Alta Drive. USA Hockey’s Pacific District is proud to introduce Flint Doungchak as the district's newest Coach-in-Chief. There is a big change coming to youth hockey, and it’s all about names. Based on a rule change by USA Hockey, age classifications will no longer have name labels like ‘midget’ or ‘bantam’ in the USAH rulebook. Instead, all age categories for youth hockey are to be referred to only by age number – 12U, 14U, 16U, etc. 2016 USA Hockey Annual Congress town hall meeting discussing Tier l hockey. Traveling through the cornfields of Iowa, there's never a shortage of time to think, ponder, and reflect. As Oliver David, Associate Head Coach and Assistant General Manager of the USHL’s Dubuque Fighting Saints, rides over the picturesque Midwestern landscape en route to his team’s next playoff game, he can’t help but do just that - think, ponder, and reflect. How did a SoCal kid that grew up with a single mom working multiple jobs now find himself helping pull the strings for one of the preeminent Tier I Junior Hockey franchises? And so quickly? Some might say it’s a wonder, achieving such great heights despite facing such seemingly insurmountable odds; but after spending a few mere moments talking to David, you’ll quickly realize that his accession upwards through the junior hockey ranks shouldn’t be a surprise, and it certainly hasn’t been by accident - if anything, it’s been destiny. Pacific District Guidebook is now available for downloading.